Let me tell you…the minute I saw this I fell in love. The combination of the blue walls, white dresser, white woodwork and wood floors just totally works. I also had a strange feeling when I opened Nicole’s blog…sort of like I had been there before but I knew I hadn’t. So I scrolled down to the bottom of her home page and sure enough I knew I wasn’t crazy. So of course I pinned her picture onto my Home Decor ~ Foyers board. Shortly after that Debbie announced her next Copy Cat Challenge with a new twist…you can copy another blogger. Well…it was a no-brainer for me. I pretty much have this exact same set-up in my entry….I even have the blue walls. My wall is much skinnier and of course my dresser isn’t white. I can’t paint it because it’s a family piece and my husband would probably strangle me. My lamp is on the right instead of the left…and I didn’t have room for the wicker candle holder. I was also fresh out of cotton bolls so I used black-eyed susans. I have a confession about the cotton bolls. I did search on Etsy and was actually going to buy some…but I couldn’t get what I wanted and I really didn’t have enough time for the whole shipping thing. but you gotta admit the cotton bolls would have been very cool. I got the apothecary jar at TJ Maxx. I couldn’t believe my luck when I saw the little bird on the lid. A little bird with the tail up too…just like my logo. 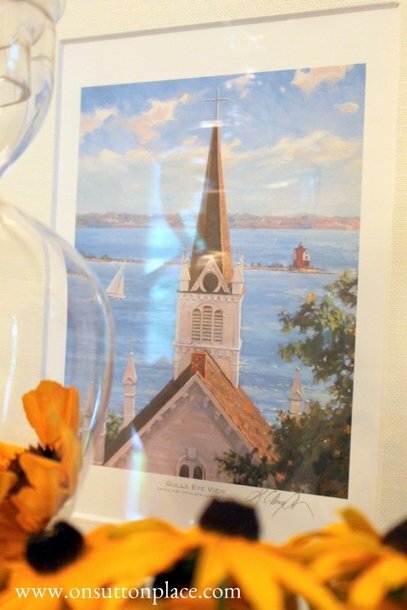 The leaning picture is of a church on Mackinac Island. 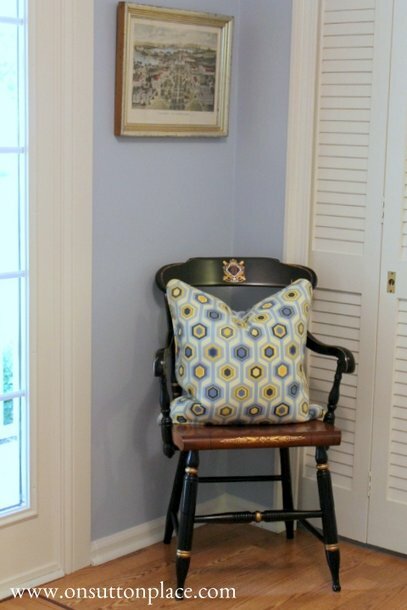 I am working on an updated Home Tour so I snapped some pics of the rest of my entry. I’m getting so used to seeing the stairway wall empty that I just may leave it like that for a while longer. My picture gallery is at the moment sitting in a spare bedroom on the floor. A project for another day. Here’s a before and after…just so you can see that really anything is possible with a little elbow grease, some paint and some inspiration. Oh…a big thank you to Nicole for sharing her entry! I love your copycat … and your entrance! Stunning. The bird apothecary? How perfect. And I love that hue of blue. And I’m eagerly anticipating your home tour! I have to say, I love your look best! 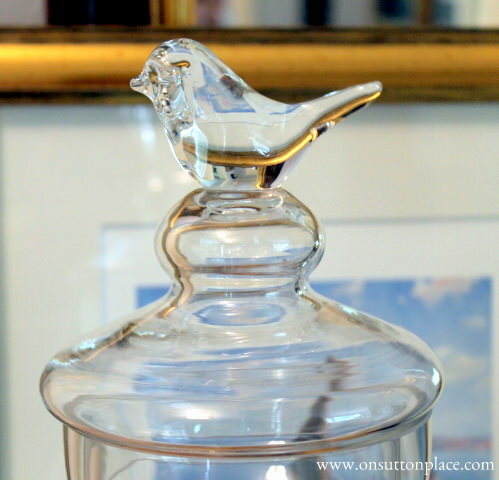 It’s more you and I’d probably arm wrestle you for that cute apothocary jar with the bird on it. What a great idea with the flowers in your jar too! I’m probably going to have to copy that. Your copy is beautiful, Ann! I love the picture of the church and the Black Eyed Susan’s add a wonderful splash of colour! Your dresser is very lovely in the entry, in fact that whole room is very beautiful. Your blog is also gorgeous! Wow!!! Thank you for the update on Tammy, I miss her. Oh it looks so pretty Ann. I love your take. Of course those flowers topped it off for me. 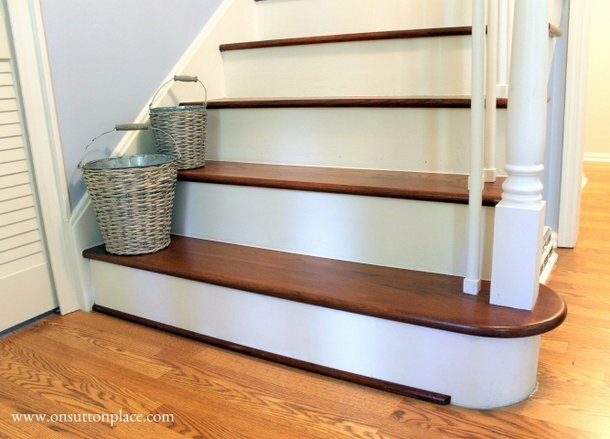 Your foyer looks amazing too. Thanks so much for sharing with the copy cat party. I sure do love it! I really love your copycat vignette, Ann. 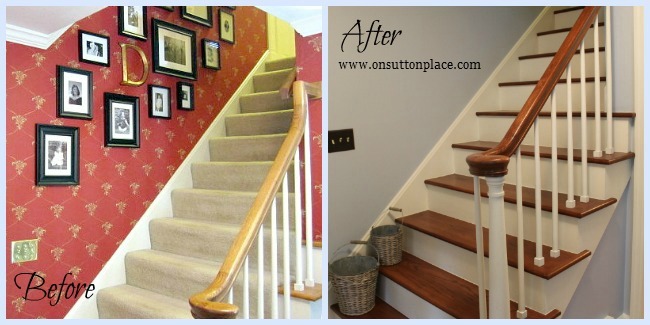 Love the paint color on the stair wall. Gorgeous, Ann! 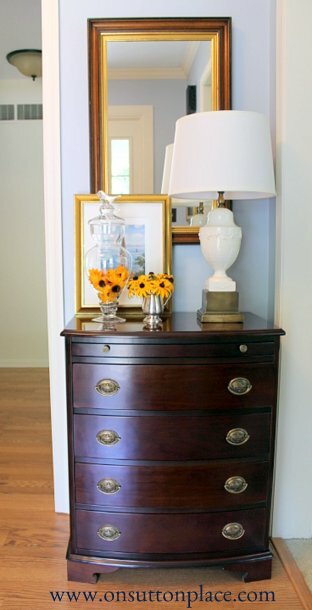 I love dressers and chests in an entry. I dream of having stairs that beautiful. Your copycat presentation is beautiful. I like the white chest, too, but understand how folks have issues with family pieces. The lamp, decor and all is charming. Love your copy cat, I can’t believe how different the entry looks. Amazing job! WAW!!! You have done an amazing job!! Love all your blog… so sunny in here!!! 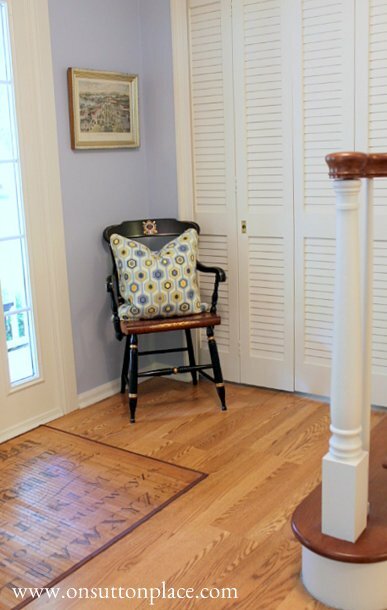 Your foyer looks great Ann. I love the new lighter look on the staircase. Your lamp is beautiful too. Beautiful copy cat. Your home is looking so lovely. Ann I am wild about your new foyer! It is soft and fresh and uncluttered. Just lovely!!!! I need to revamp my foyer too! What a great copy Ann! 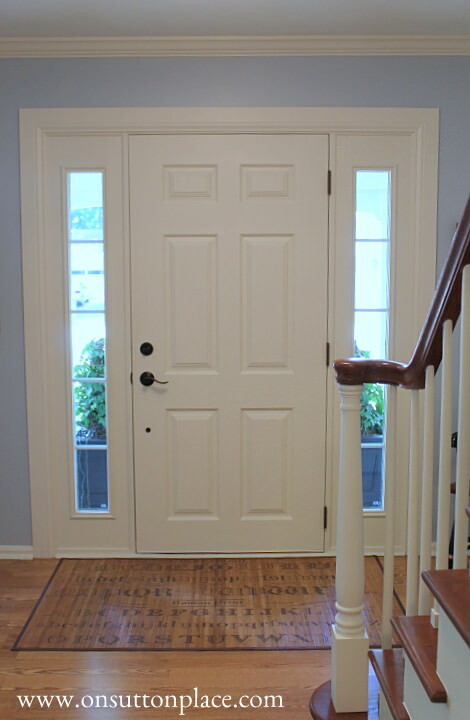 Your foyers makeover is beautiful!! Lovely inspiration and interpretation! Your paint color is so pretty and welcoming, Ann. I truly love your entry! I would never paint a family heirloom like yours, either! Fantastic copycat, my friend. What a beautiful transformation! Although I love the inspiration chest, your dark piece looks just as lovely. I think a dark piece really pops in such a neutral space. Really lovely! Your interpretation is just perfect and so special with the heirloom piece. I love the accessories you chose and the bird on the lid was a great find. Great copycat…love the Black Eyed Susans, so pretty! Your foyer looks great. I had seen your dresser in another post, but I like your copy cat view as well. I also love that floor cloth/rug you have. I do like the color of the flowers, too, tho. A good copy cat….isn’t it so fun. I love her party. come by to see mine a little later…. Ann, you must not realize that I live in an area that has tons of cotton fields! I can send you all the cotton bolls that you want soon. The plants are actually blooming right now, so it will be a month or so before I can get you some bolls! But your black-eyed daises give a great shot of color to your fabulous entry. That is one great copycat, Ann. I love the look!!! My husband would have an issue with me painting an heirloom piece, too. We know how mean can be about painting wood. I smiled at you mentioning you might leave your gallery wall empty for a while. I have and had one on a wall in our upstairs landing, and when we had it painted I decided to wait a while, too. I think my while turned into at least five years, but I finally did it. I knew I wanted to make some changes, and I’m glad I waited because now I love it. 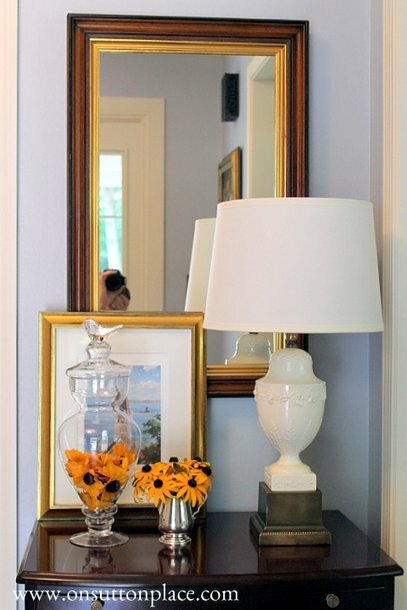 Your entryway looks fresh & lovely. I love your copycat too! First of all I am BEYOND flattered that someone was so inspired by my little entry way! Your version looks GREAT! 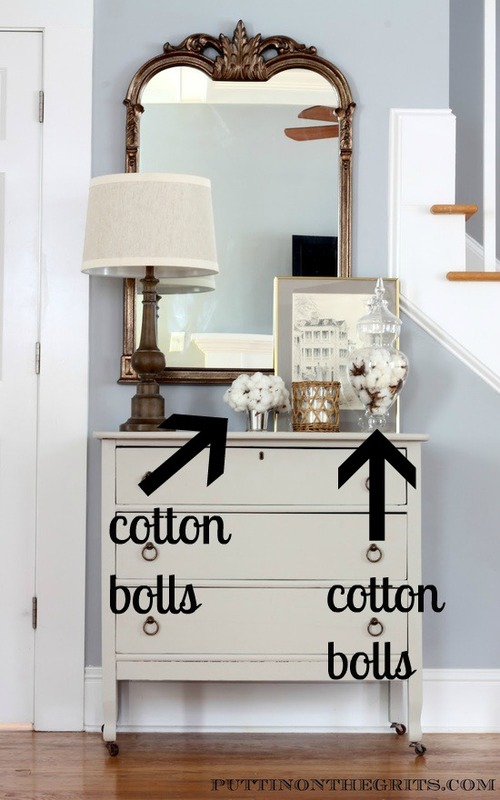 Cotton bolls or not, the flowers really pop against the dark dresser. I’ve got a stained dresser that is similar to yours (a little wider) in my dining room as a buffet and I keep going back and forth on painting it. The hepplewhite-style pulls look so great against paint but like you said…I don’t know if I should be painting a “nice antique”. I think the hardest part of decorating is figuring out what little knick knacky things to put on a table. It gets me every time! I look at so many pictures on pinterest trying to get ideas of what I can put on my coffee table and dining table. It all looks so nice, Ann. I wish I could get the carpet removed from our stairs. One of these days I will. 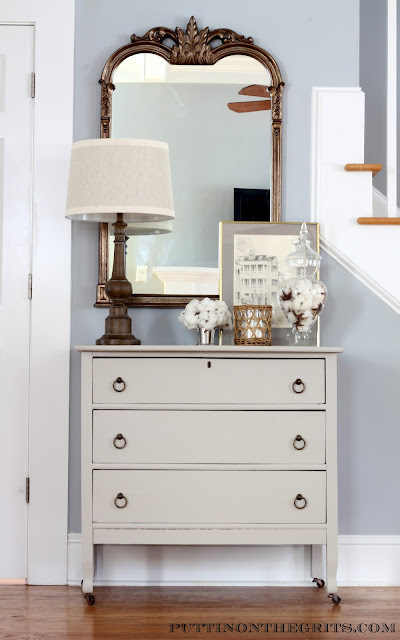 Your foyer makeover turned out so pretty! I bet it feels bigger now without all the color that you had in there before. Your chest in the foyer is styled so pretty. Love your inspiration pic too! Hi Ann, I love your interpretation. Your wall color is fabulous and what a pretty lamp. Your entry looks lovely! I also love your “Miss Mustard Seed rug” – I have one too. Great way to put a spin on an inspiration picture, Ann! I like to do that, too ~ not copy exactly, but add my own twist in some way. It looks really lovely. Good idea to hold off on the stairway wall. You may decide to go another way here and its always nice to have a blank slate for a little while. 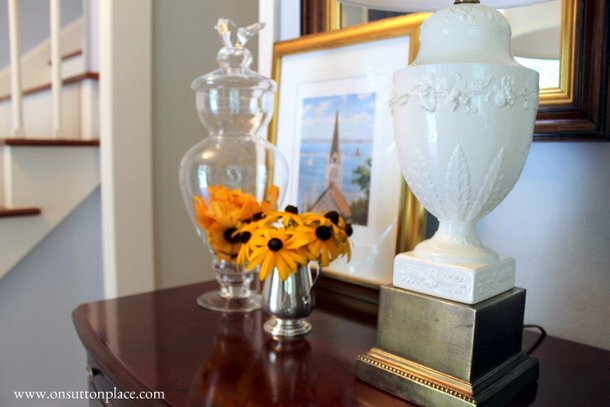 I love your interpretation of Nicole’s vignette…the black eyed Susan’s look very pretty! Your entry is gorgeous, very inviting! 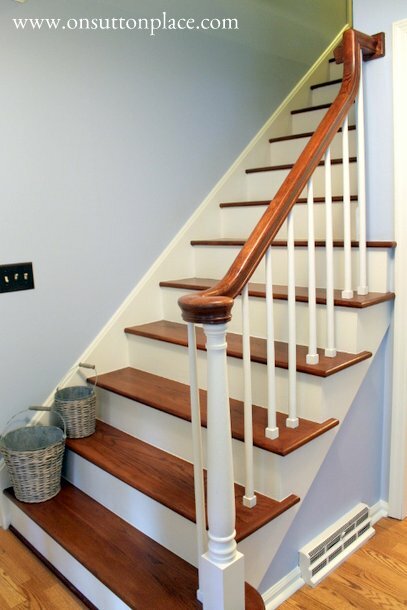 You did a fabulous job with the wall by the staircase! I love the fresh new look of your foyer Ann. Your copy cat challenged turned out great!